Vacuum Cleaner Battery Types - Do Rechargeable Batteries Die? Vacuum Cleaner Battery Types – Do Rechargeable Batteries Die? Vacuum cleaner batteries are very important parts of every portable cordless vacuum cleaner. Even if you have vacuum cleaner with best characteristics on paper, but your battery pack is failing quickly, you will not be satisfied with your cordless vacuum cleaner as a whole. – rechargeable batteries die, too. Depending on the chemistry type, rechargeable batteries even when treated properly, can withstand only limited number of charging/discharging cycles. For example, deep cycle lead acid batteries (these are NOT common car starting batteries) and nickel cadmium batteries can endure few hundreds charging/discharging cycles, nickel metal hydride batteries up to 500, while various lithium batteries ‘operate properly’ even after 1000 charging/discharging cycles. When batteries are not treated properly, their life span shortens significantly and they simply die! Note: ‘operate properly’ means that after some time all batteries lose their capacity, but this is within certain limits, according to various standards. The best tester is, You, consumer – if your vacuum is not performing as it did when you bought it due to failing battery pack, it is time to change the batteries. – always read manuals of your cordless vacuum cleaners. 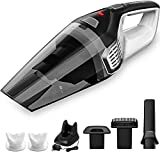 Which handheld vacuum cleaner or backpack vacuum cleaner (or any other type of battery powered vacuum cleaner) you have, determines which replacement battery you will have to purchase. Read and write down exact replacement part ID number of your battery and of course which vacuum cleaner you have. This way you will certainly buy proper battery pack. – non-oem replacement battery packs are generally cheaper than oem replacement batteries, but they are not tested thoroughly as oem’s battery packs and more often lack performance of original batteries. Sometimes, new original battery packs cost almost as brand new cordless vacuum cleaner – in these cases buy non-oem replacement battery packs, but read what other customers have to say regarding batteries you are about to buy. 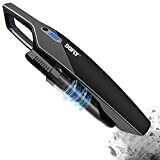 If reviews of non-oem batteries are bad, there is no point in buying such battery – buy oem battery even if it costs almost as much as new cordless vacuum or simply buy a new cordless vacuum cleaner. IMHO, of course. – if you have vacuum cleaner that has battery pack consisting of ordinary consumer (most often AA or AAA) cell batteries (some cordless handheld or car vacuum cleaners), always replace all batteries (cheaper in the end) with new batteries having exact battery chemistry like old ones. When buying new batteries, try to buy good quality batteries – they last much longer and can endure more charging/discharging cycles and their self-discharge rate is much lower. Most common consumer primary and rechargeable batteries used in cordless vacuum cleaners are AA, AAA, 18650, CR2032, CR123A, LR44 and other similar alkaline, silver oxide, NiCd, NiMH and lithium batteries. Such batteries are mostly used as energy source to power main motor which creates suction. Also, coin or button cell batteries like CR2032, LR44 and similar are found in high-end vacuum cleaners’ electronics – although some of coin batteries are available as rechargeable batteries, I still haven’t found a rechargeable coin/button battery in any cordless or corded vacuum cleaner. Anyway, when CR2032 or LR44 batteries fail, they are simply replaced by a new one – such batteries hold their charge for many years and many owners of high-end vacuums that have such batteries are not aware of it, until they have to change them. – although memory effect of new battery types is much less obvious than in previous generations, it is highly recommended, from time to time – usually every couple of months (depending on usage frequency), to fully charge and than to fully discharge your vacuum cleaner and than to fully charge it again. This will refresh battery capacity and make batteries last longer. If you have vacuum cleaner with cell batteries (AA or AAA batteries), than small extra battery charger with discharge function can come very handy. – Lead Acid batteries for vacuum cleaners are mostly used in older cordless vacuum cleaners or where weight is not important. They use same chemistry as car batteries, but mostly have electrolyte in the form of gel – gel cell batteries – this electrolyte can’t be spilled and battery normally operates in any position. They lose capacity rapidly if discharged using high currents, but they are pretty immune to memory effect. Very cheap. There is a big difference between deep-cycle and starting/cranking lead acid batteries. Lead acid batteries used in vacuum cleaners and autonomous scrubbers should use deep-cycle, Valve Regulated Lead Acid (VRLA) batteries, either gel cell or Absorbed Glass Mat (AGM) Sealed Lead Acid (SLA) batteries. Such batteries are practically maintenance free, vibration resistant and can operate in any position, without the danger of spilling the electrolyte. Note that even such batteries should NOT be discharged more than 20-25% of their initial capacity, or they may be damaged. For more on this topic, check Deep Cycle Marine Battery site (external link). – NiCd – Nickel Cadmium batteries are not very environment friendly. Their relative capacity is better than in lead acid batteries, especially when using high discharge currents (more than 1C currents). In fact, NiCd batteries are one of the best batteries for insanely high discharge currents – up to 30-50C, although these currents are rarely (if at all) used in vacuum cleaners. They are more expensive than lead acid batteries and prone to memory effect. – NiMH – Nickel metal hydride batteries are often found in cordless vacuum cleaners and in cordless appliances in general. Most modern appliances have low self-discharge NiMH batteries that can stay several months on the shelf and lose only few percent of their charge. They have higher capacity than lead acid or NiCd batteries, almost no memory effect (no memory effect according to manufacturers, but from time to time capacity ‘refresh’ comes handy) and they are much more environment friendly. They have lower discharge currents than NiCd or lead acid batteries (in terms of ‘C’ currents), but due to the higher capacity and other benefits, they have replaced almost entirely lead acid and NiCd batteries in battery powered vacuum cleaners. – Lithium-ion batteries and lithium ion polymer batteries are ‘high-end’ batteries in terms of capacity vs mass, they have no memory effect, can be discharge with relatively high currents, last long and they are one of the most expensive type of batteries used in cordless vacuum cleaners. Other type of batteries are sometime used too, but rarely. – if battery have 20 Ah capacity, that means that it is able to produce constant 1A current for 20 hours. Same battery will be able to produce 20A current, but for less than an hour. Or even 200A current for less than 6 (six) minutes – actual discharging time at high currents determines the battery’s capability to produce high currents. In cordless vacuum cleaners discharging times are often more than half hour, so extra high current batteries are not needed – NiMH batteries fit at these discharging currents nicely. – if battery is discharge at 1C, that means that 20Ah battery is discharge at rate of 20A. Manufacturers often give tables showing how long can battery produce for example 1C, 2C, 5C currents. Good NiMH batteries can be discharge at 1C rate for more than 50 minutes. If battery is kept fully charged for months, it can ‘forget’ it’s capacity. Really. Memory effect is problem for NiCd batteries in appliances that are constantly kept in docking stations and charged constantly. This can kill your batteries within a year, if you don’t use your cordless vacuum cleaner often. That is why you should regularly (once a month for NiCd batteries) fully discharge your vacuum cleaner and than charge it, again, fully. Other types of batteries don’t have this problem, at least not as NiCd batteries – older NiMh batteries had this issues, but newer NiMh batteries with low self-discharge rate memory effect is almost gone. Again, it is good practice to fully discharge your cordless vacuum cleaner from time to time – at least, once a month, no matter what manufacturers say about their batteries. Since batteries use different chemistry, you MUST use battery charger that came with your vacuum cleaner or battery charger that is exclusively made for that battery chemistry – if you don’t do that expect fires or even battery explosions, so what ever you do, you do it on your own responsibility. 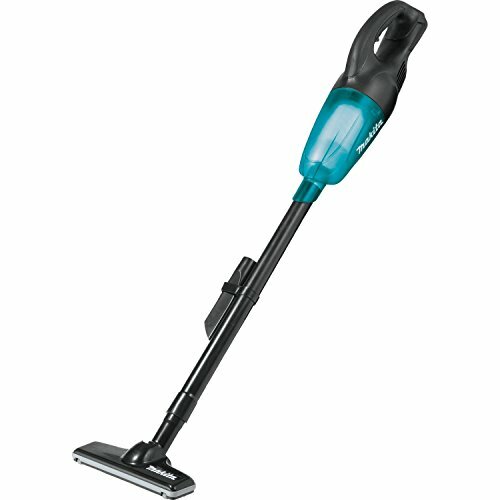 Is 18V Cordless Vacuum Cleaner Stronger Than 12V Cordless? Nominal voltage of lead acid battery cell (today rarely used in cordless vacuums, but these are still present in cars, UPS devices, boats etc) is 2V, NiCd and NiMh cell voltage is 1.2V and lithium battery cells have around 3.6V – keep this ‘around’ in mind for lithium batteries, since they come in various versions and chemistry that vary slightly and their cell voltage can vary a little bit. – 18V lithium battery has ONLY 5 cells. So, for the same power, if voltage is increased, current can be decreased. Weaker current means lower power loses in cables, but also less stress to the battery. – operating time is increased since newer battery with 7Ah capacity can be drained little bit longer with 2x stronger current than older 3.5Ah battery due to lower capacity loses when battery is drained with stronger current, for example, if older vacuum operated 15 minutes at full power, then new model will probably operate at least 20 or even 25 minutes. Anyway, as this examples clearly demonstrates, newer battery types is the way to go when performance is required – meaning lithium batteries. For cheaper cordless vacuums, NiMh batteries are still great power source that will still be around for years. we want a rechargeable cordless vacuum cleaner where we can replace the battery.